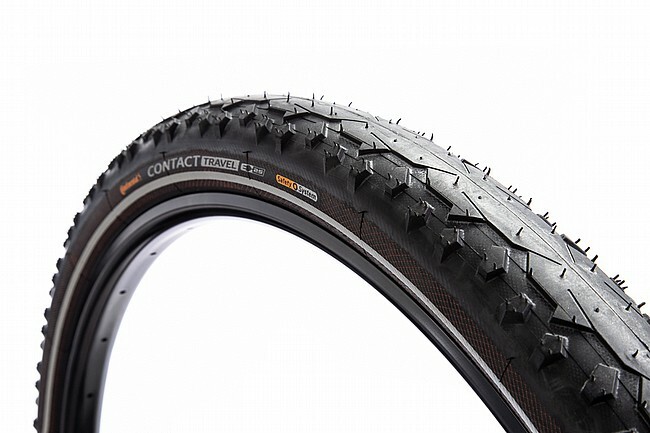 The Contact Travel Reflective 700c Tire from Continental is a durable, comfortable, endurance / touring tire with semi-slick tread that allows you to confidently maintain rubber-side-down contact on all kinds of terrain. Two protection systems -- Safety System Breaker and Duraskin -- keep this tire inflated and rolling well beyond the lifespan of many other tires thanks to features like an aramid reinforced fabric layer under the tread and a lightweight, cut-resistant sheath. With such durable construction, the Contact Travel is e-bike compatible, too -- recommended for e-bikes of up to 25km/hr. E-bike compatible, up to 25km/hr. Weight: 555g (700x37), 620g (x42), 870g (x50). Use: touring, endurance; mix terrain.